A 43-year-old male patient presented with a mass lesion on the right liver lobe, segment 5, in radiological imaging and elevated alpha-fetoprotein levels (323 ng/mL) compatible with hepatocellular carcinoma (HCC). Positron emission tomography/computed tomography (PET/CT) images showed background level 18F-FDG uptake in the mass lesion. In addition, a secondary focus of increased 18F-FDG uptake was detected on the left liver lobe, segment 2, approximately 1,5 cm in diameter. Histopathological examination revealed HCC in the larger mass lesion with a lower 18F-FDG uptake, and cholangiocellular carcinoma in the smaller mass lesion with a higher 18F-FDG uptake. To our knowledge, this is the first case report of two histopathologically different primary malignant liver tumors in two distinct segments of the liver detected by PET/CT. Informed Consent: Consent form was filled out by participant. Surgical and Medical Practices: H.M.T., Concept: E.B.E., H.M.T., E.T., M.A., Design: E.B.E., M.A., Data Collection or Processing: E.B.E., H.M.T., Analysis or Interpretation: E.B.E., M.A., Literature Search: E.B.E., Writing: E.B.E., E.T., M.A. Hu J, Yuan R, Huang C, Shao J, Zou S, Wang K. Double primary hepatic cancer (hepatocellular carcinoma and intrahepatic cholangiocellular carcinoma) originating from hepatic progenitor cell: a case report and review of the literature. World J Surg Oncol 2016;14:218. Watanabe T, Sakata J, Ishikawa T, Shirai Y, Suda T, Hirono H, Hasegawa K, Soga K, Shibasaki K, Saito Y, Umezu H. Synchronous development of HCC and CCC in the same subsegment of the liver in a patient with type C liver cirrhosis. World J Hepatol 2009;31:103-109. Kanamoto M, Yoshizumi T, Ikegami T, Imura S, Morine Y, Ikemoto T, Sano N, Shimada M. Cholangiolocellular carcinoma containing hepatocellular carcinoma and cholangiocellular carcinoma, extremely rare tumor of the liver: a case report. J Med Invest 2008;55:161-165. Lee JD, Yang WI, Park YN, Kim KS, Choi JS, Yun M, Ko D, Kim TS, Cho AE, Kim HM, Han KH, Im SS, Ahn YH, Choi CW, Park JH. Different glucose uptake and glycolytic mechanisms between hepatocellular carcinoma and intrahepatic mass-forming cholangiocellular carcinoma with increased (18)F-FDG uptake. J Nucl Med 2005;46:1753-1759. Weber G, Morris HP. Comparative biochemistry of hepatomas. III. carbohydrate enzymes in liver tumors of different growth rates. Cancer Res 1963;23:987-994. Fritscher-Ravens A, Bohuslavizki KH, Broering DC, Jenicke L, Schäfer H, Buchert R, Rogiers X, Clausen M. FDG PET in the diagnosis of hilar cholangiocellular carcinoma. Nucl Med Commun 2001;22:1277-1285. 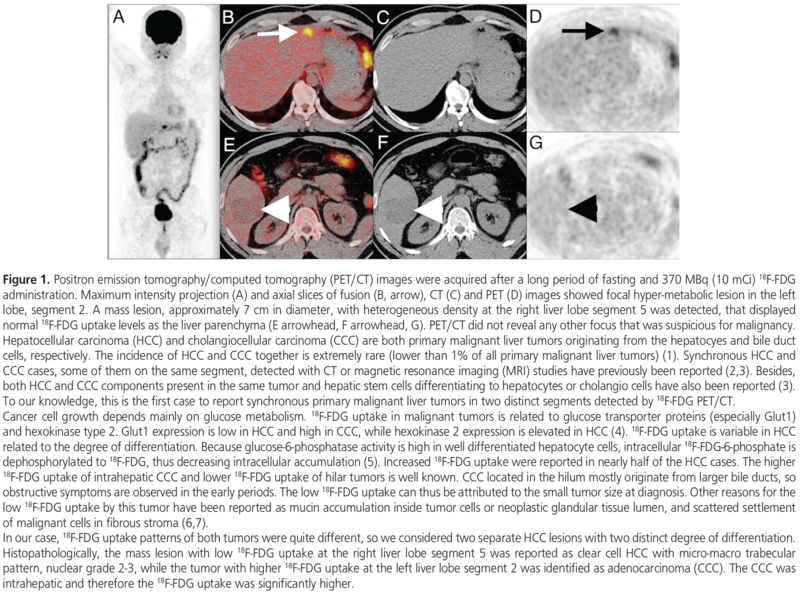 Jiang L, Tan H, Panje CM, Yu H, Xiu Y, Shi H. Role of 18F-FDG PET/CT imaging in intrahepatic cholangiocellular carcinoma. Clin Nucl Med 2016;41:1-7.